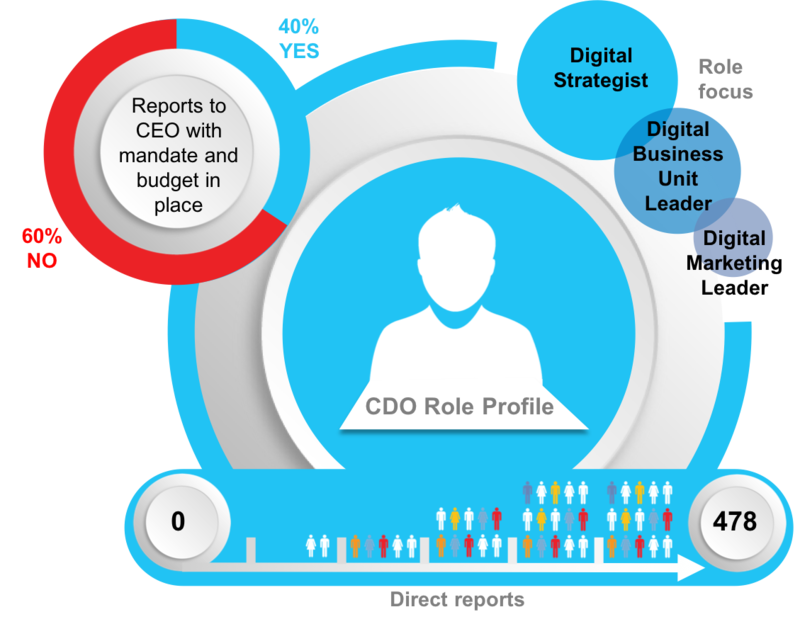 The Chief Digital Officer (CDO) role in South Africa is loosely defined and misunderstood. We interviewed CDOs in five leading financial services organisations in South Africa to discover the ill-defined but increasingly important circumstances many CDOs operate under. CDOs have high ambitions yet most are still trying to garner support by focusing on tactical initiatives. The future involves ratcheting up the speed and scope of progress to build a case for strategic, transformational change. The majority of CDOs we spoke to are focused on building a shared vision for digital in their organisations. A few have advanced further and are scaling up a portfolio of digital initiatives with organisational support. In some cases, leadership in these organisations already believe they are digitally proficient, which makes broadening the CDO agenda more difficult. The CDOs define digital in many ways however most agree that their organisations see digital as websites, apps and other user interfaces – but they agree that digital is enterprise and value chain wide. While advancing the strategic agenda, execution is focused on tactical initiatives to build credibility. Examples of specific tactical activities being pursued are running decision forums, building a digital channel, delivering innovative digital projects and consulting to business on the impacts of digital disruption, or transferring expertise and knowledge. Compared to progress in more developed economies, digital maturity appears to be relatively low in South Africa. Low growth and uncertainty have no doubt contributed to a cautious approach where large, incumbent organisations have sought digital innovation from fintech, insurtech or other partners, as well as build their own digital solutions. 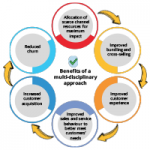 Very little has however gone beyond traditional e-commerce or multichannel customer engagement to introduce new sources of revenue or new business models. This may change as incumbents become increasingly challenged by new ‘all digital’ entrants. One CDO raised that every conversation he had through the vertical organisation resulted in a different understanding of the term ‘digital’. This is problematic and often a reason for lacklustre focus and unclear mandates from the executive level. A common purpose for digital is often dispensed with in the rush to deliver and get someone in to ‘sort out digital’. CDOs want to be playing a transformational and strategic role, which means bringing about new sources of value for customers and radical operating model change. The reality, though, is they don’t always have a voice on executive committees, the top-down support nor the clarity of mandate. An unclear tone from the top is resulting in lacklustre enterprise-wide impact and poor digital value realisation. In addition, CDOs lack the budget and people to build new capabilities. In an outcomes-based corporate, the realisation of value subsequently becomes exponentially difficult. To make a difference and build rapport, CDOs are driven to be short-termist, delivering operational improvements to the existing business. One CDO, with a small team and no executive exposure, created focus and delivery impetus by carving out the front-end design of the customer-interface application in a long running insurance claims system transformation project. He used this success to motivate for a greater role, budget and mandate as an enterprise-wide digital strategy advocate. As incremental steps are entrenched through small project contributions a strong, execution-focused CDO role is resulting in performance measurement being focused on traditional return on investment (ROI) metrics only. In the majority of cases CDOs have no clear measures, long timelines or are ‘still to be defined’. This situation perpetuates a potential stagnation of the role and is indicative of the confusion about what should be done with the role and its value focus. CDOs indicated their difficulties with reconciling the multi-dimensional skills and cross-cutting functional impact of digital initiatives. In many instances this has resulted in CDOs lamenting that their days are spent building relationships, convincing and ‘selling digital’. It appears that few organisations have resolved the conflicts between the customer-operations-technology ecosystem. CDOs indicated they are trying two primary approaches to bridge the gap between current operational reality and strategic ambition. Alternatively, they are investing time to play the broker / consulting role, by attempting to convince executive leadership that digital needs to be considered holistically and touch all points of the value chain. In summary, the irony is CDOs are trying to convince their organisations about the transformational benefits of digital while delivering incremental gains. Internal support for the digital agenda is only growing slowly. The high level of uncertainty experienced by CDOs is reminiscent of the volatility in the global economy. Consequently, CDOs are playing a strong role to support and prioritise greater flexibility and speed of change through new ways of working. Through new continuous change techniques and methods a CDO’s team becomes the digital change-agent that uses Agile, User-Experience (UX) and Design Thinking approaches to support rapid execution. Digital teams have often become mini-skunk works for testing new ways of working, in environments where executives are cautious about large-scale organisational design. In these micro-delivery teams, traditional linear project delivery methods are reformed into iterative, outcome and value based approaches. Critical to this is the data- and ethnographic-led agendas, where customer need and value lead the organisational design of segments, channels and products. Inherent to these new ways of working are cross-functional squads that deliver in tight-knit groups to deliver specific products or service improvements. Naturally, the people in these teams have to leverage the good out of the inevitable conflict between disparate functional ideologies. One CDO articulated that his one project team had a fundamental disagreement at the start of the project between the systems architect and the UX lead analyst. Each pushed their position without regard for the others, in his broker/consultant role the CDO had to mediate for common ground – now they work smoothly as they understand each other’s language and are advocates for opposing ideas to their functional teams. Nevertheless, there are signs of change. New ways of working and innovation units are emerging in many financial services organisations. The rate of change and increasingly outcomes-driven business environment favours CDOs who deliver confidently and strongly. Elevate early successes by demonstrating that new ways of working can deliver measurable results to time, cost and quality expectations whilst pioneering cross-functional learning. 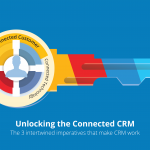 Use this to drive enterprise-wide culture changes that embrace employees and customers alike. Experiment in strategic projects with measures of convenience, transparency and other qualitative metrics that articulate customer-centric value better. Use this to motivate for new digital measures of success. Explore opportunities across the entire value chain from front-end customer engagement solutions to middle-office and back-end supplier partnerships. Use this to show end-to-end value and the strategic business transformation potential. CDOs are positive about the contribution that can be made by the role. By following a strong delivery approach in the end-to-end value chain we believe that a strategic digital agenda can be supported. Looking to execute your data-led and customer-centric digital operating model? For us it’s about supporting you to demonstrate better customer value and achieve your business’ ambitions. We are an intimate business that is hungry to make a difference in South Africa. BSG has the knowledge and experience to support you to bridge the gap between current operational reality and strategic ambition. For over two decades, BSG continues to help their clients solve their most important problems. Following a data-led approach, underpinned by strategy execution, BSG can support you to solve your most important problems. Schoeman has more than 19 years’ experience in the consulting industry across a diverse range of client industries and roles. He joined BSG in 2007 after 7 years with Accenture and headed numerous key areas during his tenure, before taking over as CEO in early 2018. Schoeman is a dynamic leader who believes in growing businesses through a data-led approach that provides insights and solutions, giving customers what they need. With over two decades experience at BSG, Stocks is responsible for research, trends and insights and is passionate about unlocking potential and accelerating performance for clients and our people. He plays a key and strategic role, seeing projects from conceptualisation to implementation. His current focus is on creating value in an increasingly digital world through customer-centric thinking and data-driven insights. Baxter has over 12 years’ of experience in the strategy consulting industry across Banking, Insurance and other industries. His current responsibilities include leading the delivery of strategic projects that link strategic thinking to operational implementation using customer and fact-based research techniques. He is passionate about making strategy real through formal assessment and design approaches.